European sports cars that typically stay in Europe are often begged to be brought over by automotive journalists and die-hard enthusiasts. 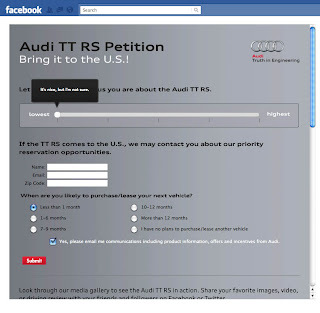 Audi is taking a different path, possibly to prove how much begging there really is for a their only available in Europe TT RS sports car, by asking social media participants on Facebook and Twitter if they are interested in signing a 'petition' to bring the TT RS to the United States. Supposedly, Audi will do it if there is enough interest. As someone intimately familiar with product planning, the whole idea of asking random people in social media to show interest in your car is a bit ridiculous. Sure it creates some nice social media engagement numbers like app installs on Facebook, tweets on Twitter and comments on your brand fan page but is the effort truly reaching real customers of the TT RS. Product planning isn't about social popularity, but rather marketability and profitability of a product against the competition in its segment, at least that's a good portion of the decision. Asking random people if they want X product is not. Regardless of how sincere Audi is about their 'petition', the effort now includes some advertising on Facebook and an application where one can share their seriousness for buying one and provided the images load -- they did not for me after many attempts -- one can share pictures of the TT RS. 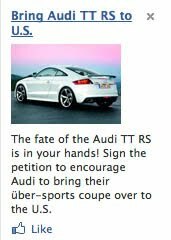 Audi is definitely finding a new way to turn the begging done by enthusiasts into a social conversation and that at least is an interesting concept. 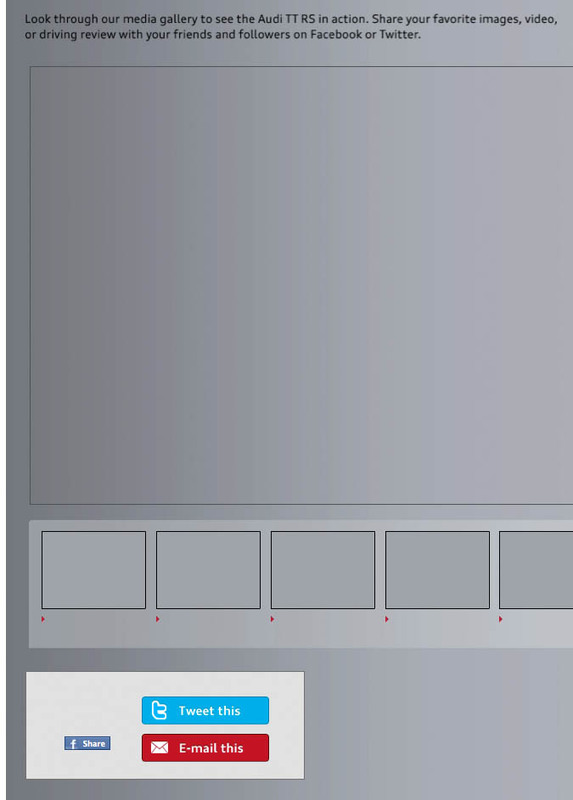 Now we'll just have to see if 122 application Likes on Facebook is enough to influence product planning. Nice to know about your post related to Audi. This is really one of the awesome factor to get more detailed on a Audi. But can you please tell me which car dealer is best in Europe for the supply of new Audi models?